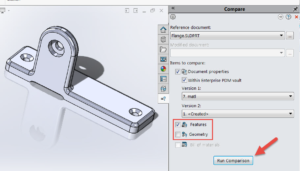 Comparing Versions of Part and Drawing Files in PDM...Yes You Can! 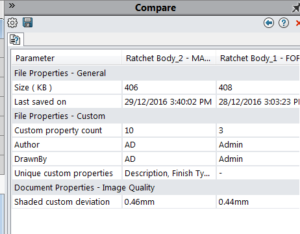 How do you compare versions of Part files in PDM? 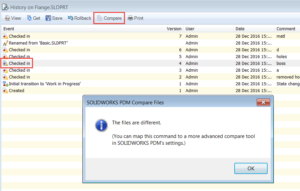 Perhaps you review each version of the part using the Get Version command and viewing it in the PDM Vault View Preview tab. That will work, but how do you remember all the changes between one version and the next when you cannot look at them at the same time? 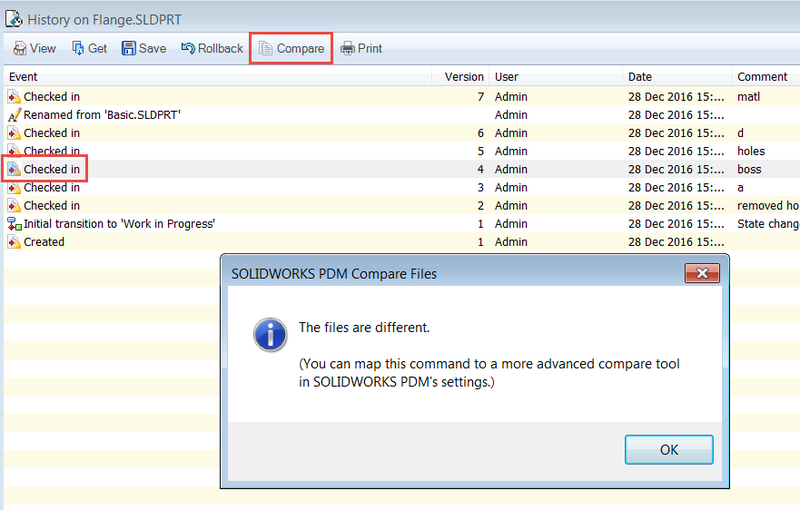 Or perhaps you knew of the Compare tool found in the History window of PDM. Simply click on an older version of the file and then click the Compare button… Wait a minute…not too useful, is it? But hold on there…there is another tool to compare versions and it does a much better job. Not too many people know it exists, but I’m here to show you not only where it is, but how to use it. 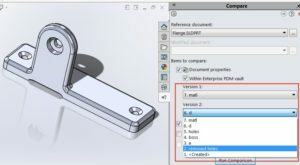 Let’s take a look… First, let’s open a file in SOLIDWORKS that is stored in the PDM vault and has multiple versions… Once the file is open, let’s open the Compare Features tool (Tools>>Compare>>Features…) Now, many of you know this tool can be used to compare different files, but it can also be used to compare versions of the same file within the PDM Vault. To do this, select the open file from the Reference Document: pull-down, then click the Document Properties checkbox from the Compare window… ...and then select the Within Enterprise PDM Vault checkbox. 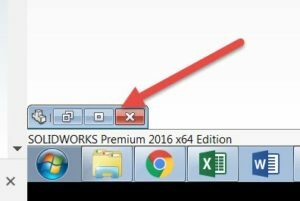 This checkbox is not available in a standard SOLIDWORKS install. 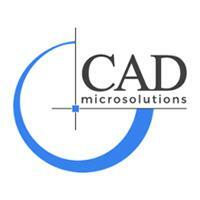 This requires the PDM Client CAD Editor to be installed. From the two new pull-downs that appear, select the versions you want to compare. The latest version appears in the Version 1: pull-down, but that can be changed. You can compare any two versions. As required make the select to compare features and/or Geometry. Once the selections have been made, click Run Comparison. The system will then run an analysis of the versions selected and present two new windows showing the two versions selected (with version selected from the Version 1: pull-down appearing at the top). 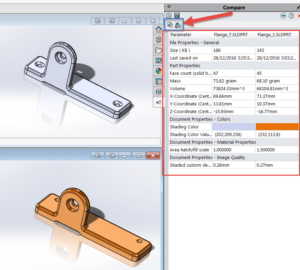 The Compare Documents Result tab is also shown in the Compare function window. However, to visually see the changes, switch to the Compare Features Result tab (indicated below). The windows showing the 2 versions will then change to visually highlight the differences. 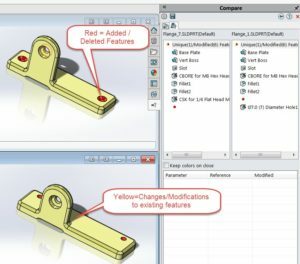 Yellow indicates changes to existing features while red indicated additions or deletions to the part. Red in the top window indicates additions while red in the lower window indicates deletions. A small red dot in the Compare Features Results will also indicate this. The extra nice thing about this interface is that you can navigate in one of the version windows (zoom, pan, rotate, etc.) and the part shown in other version window will follow suit. There is no need to navigate to a specific portion of the part in one window and then repeat the process in the other Once you are down with the compare analysis, simply close the Compare Tool window. The original part opened is still open in the background, but minimized. Simply maximize it to continue work on the part.